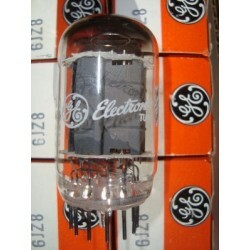 Quality 9 pin miniature glass double triode tubes manufactured in Japan by renowned Philips. These tubes are designed as vertical and horizontal deflection oscillators in TV receivers; they may also serve as phase inverters, multivibrators and amplifiers. They have gray plates and top halo getters, are printed in white PHILIPS JAPAN 6FQ7 / 6CG7 and coded QR. Boxes are standard orange and yellow printed PHILIPS 6FQ7 6CG7 QR JAPAN.